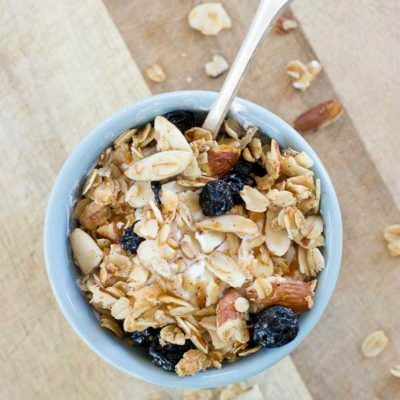 In large bowl, mix together oats, almonds, blueberries, coconut, cinnamon, salt, and vanilla extract. In small bowl, stir together honey and coconut oil. Stir coconut oil honey mixture into oat mixture and toss to coat. Spread granola evenly on baking sheet; Bake for 30 minutes, stirring half way through. Allow to cool completely before storing in air tight container.